Last year’s avocados didn’t do much. This year’s crop, however? So far, so good. 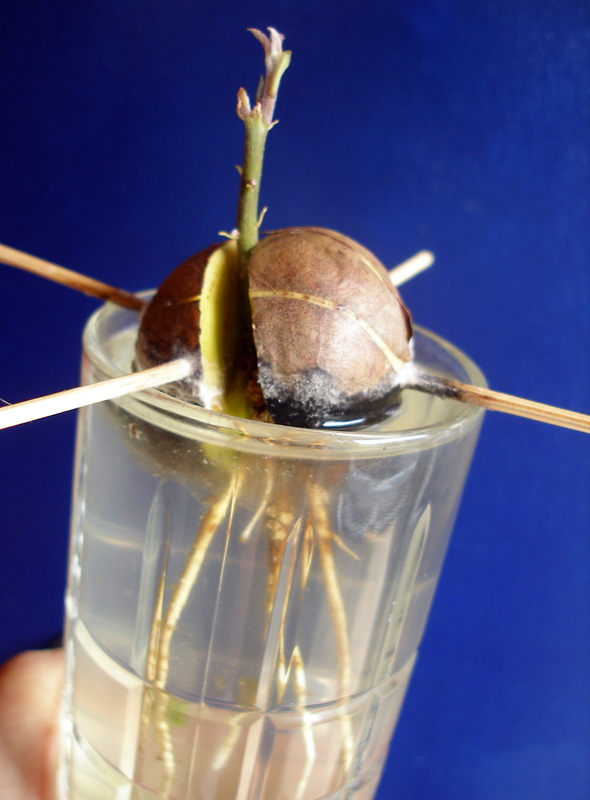 And so, just for you, a special edition of growing an avocado from seed: new and revised. Rinse the pits under cool water, wipe off any remaining goo. The pit should feel dry, not slimy. This will allow you to suspend the pit in a glass of water. The flat side of the pit should be in the water and the pointy side should be facing straight up. Keep the water level in the glass high enough to cover the bottom 1/3-1/2 of the pit. Place the glass in a sunny windowsill. You should replace the water each week as the pit needs oxygen to survive. In three to six weeks the top of the pit will crack and roots will begin to form into the water glass. 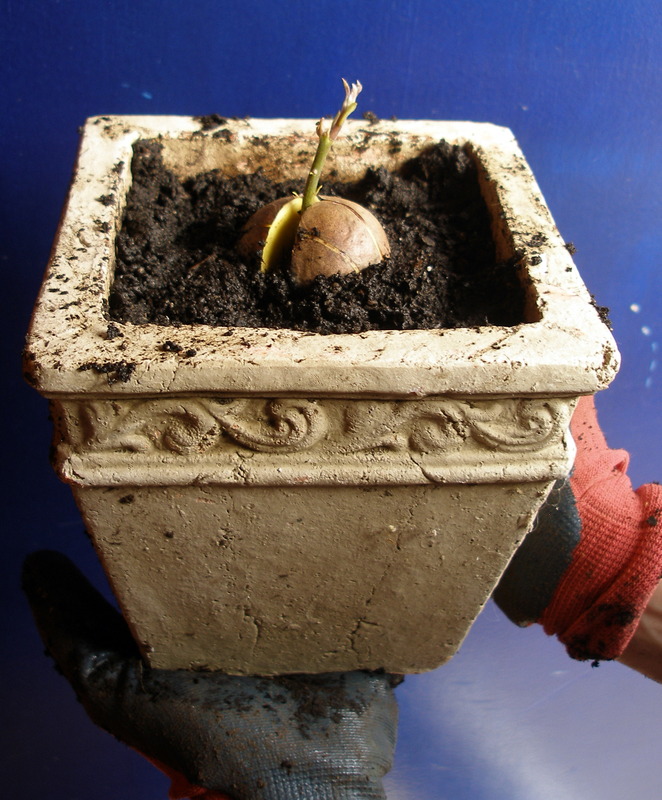 Eventually, weeks later, a sprout will appear, as if by some kind of slow-motion magic. When your sprout is four to six inches tall and you have several roots soaking up the water, it’s time to transplant that puppy into some dirt. To encourage a bushy plant (instead of a spindly tree-like thing) pinch off the top set of leaves. A new set of leaves should sprout in a couple of weeks. Water slowly, gently and generously. Keep the soil moist. Evidently, these suckers can grow up to 20-40′, so it’s important to pinch leaves off regularly to encourage a bushy plant. So, every six inches or so, lop off the newest sets of leaves. It’s a good idea to plant more than one pitling to encourage pollination. Will you ever harvest an avocado? Probabaly not — but hey, maybe…after a decade or so. But only if you’ve planted several companions for your pitling. And if you’re prepared for it to look like an anemic cousin to that pretty Haas you originally planted. Reblogged this on My Blog…say what?? ?.